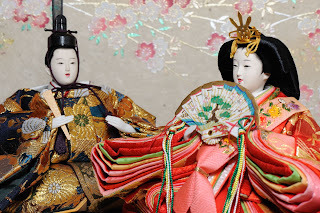 “Hinamatsuri” (Doll Festival or Girl’s Day) is held on March 3 when families wish their daughters’ healthy growth and happiness. For this day, a set of dolls representing the Emperor and Empress in traditional court dress is displayed at home. Also, various colorful sweets are often seen during this season such as hina-arare (bite-sized crackers), hishimochi (a diamond-shaped colored rice cake) and hina-dango (colorful dumpling). 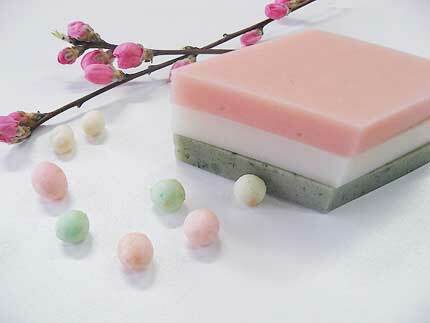 Usually, the combination of three colors of “pink, white and green” is used for these sweets. It represents the arrival of spring, which people have long awaited. Pink represents ume (Japanese apricot flower), white does snow, and green does new buds. Like these sweets, we have special “seasonal sweets” to represent season throughout the year. Seeing those annual sweets remind us of changing of the season. In other words, I can say we have a good excuse to have a seasonal teatime. I am not a girl anymore, but I used to be. So, I am allowed to have "Hinamatsuri" sweets with tea, right?